Environmental pollution takes many forms. The word ‘pollution’ may bring to mind grey clouds of motor vehicle exhaust released into the air on a busy highway or scenes of plastic accumulating on the bank of a waterway. Although much less apparent, soil contamination is also a major form of environmental pollution. Airborne contaminants deposit into soil, contaminated water or effluent from industry may eventually flow into soil, and agricultural practices such as pesticide use can directly contribute to soil contamination. Whether intentionally deposited into soil or by accident, such pollutants can remain in the ground for many years and build up over time. This means that historical sources of pollution can be found in soil many years later. The diversity of sources and long timeframe of accumulation of pollutants creates a jigsaw puzzle for environmental scientists. 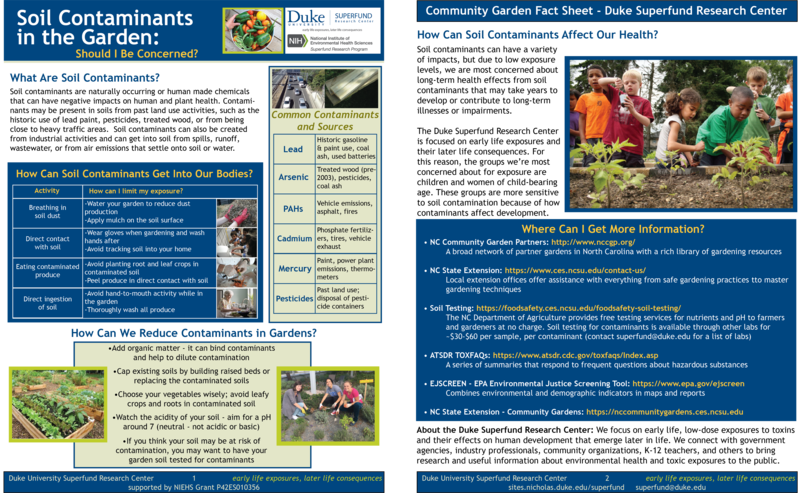 Understanding soil contamination in community gardens throughout North Carolina is a focus of the Duke University Superfund Research Center’s Community Engagement and Research Translation Cores. The CEC and RTC are currently in the midst of a five-year-long study examining soil contaminants in community gardens. When I joined the RTC in May, the Cores were awaiting soil screening test results for samples from ten community gardens. We recently received these results, and are getting ready to do further tests to better understand soil contamination at some of these sites. Why should we consider soil contaminants in community gardens? In most aspects of our daily lives, we take into account how our actions may affect our health, and we take preventative measures to reduce the risk to our health. Just as we put our seatbelt on before we drive or ride in a car, we should take precautions when gardening in order to minimize health risks. Testing for soil contaminants is the first step to understanding how gardening may affect our health. How is soil contamination quantified? A soil sample can be taken at any site and sent to a chemistry lab for processing and evaluation. Soil screening tests can be used to look for many types of chemical compounds. For example, our soil was evaluated for a set of heavy metal contaminants likely to be in garden soil, which included lead and arsenic. Other tests may also evaluate organic contaminants, which include compounds found in pesticides, dry cleaning chemicals, incomplete combustion products formed by burning fossil fuels, or the fossil fuels themselves. These types of screening tests report the concentration, a ratio of contaminant weight per total weight of soil sample, in a unit called “parts per million,” or ppm. A single ppm is a very small amount, comparable to 1 penny out of $10,000 or 4 drops of ink in a 55 gallon barrel of water. Conducting a screening test is an efficient way to learn the general composition of a soil sample. Once the soil composition is better understood, it becomes a matter of determining the importance of each soil contaminant concentration in order to properly characterize health risks. How is soil contamination defined and assessed? The United States Environmental Protection Agency is a federal organization charged with protecting human health and the environment. Setting and enforcing standards for various forms of contamination in the environment is one way that the EPA fulfills its obligation to protect health. Although the EPA has set enforceable standards for common airborne contaminants under the Clean Air Act1 and water contaminants under the Safe Drinking Water and Clean Water Acts,2 there are no regulatory standards for contaminants in soil. This causes considerable debate at the state level over the concentration at which a soil contaminant becomes hazardous for health. Most states have created guidance values for soil contamination based on EPA’s suggested Regional Screening Levels,3 but the value deemed hazardous for health can vary considerably between states. Why is there no uniform regulatory procedure for contaminants in soil? Given the large number of variables that exist at a site and that must be accounted for in risk assessment, it makes sense that there are no steadfast rules governing soil contamination. Instances of soil contamination should be considered on a case-by-case basis so that health risks are neither under- or overestimated. So how do we know whether soil contamination is of concern? Conducting a thorough site assessment with all of the aforementioned factors in mind is key to sufficiently describing the health risks present due to soil contamination in a garden. A large portion of my internship focused on researching some of these factors so that the staff of the RTC and CEC were able to properly characterize the risk of soil contamination at these 10 community gardens. With this knowledge, we were able to effectively communicate with gardeners in a way that simultaneously promotes gardening while encouraging health-protective behaviors. 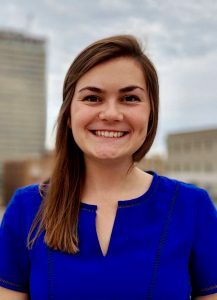 More broadly, this internship has opened my eyes to the challenges associated with creating sustainable environmental policy that is appropriate for both the region and issue of concern. I have learned that there are a multitude of ways to characterize risk, and that many factors must be considered for any given environmental intervention or solution, and that many of those factors are site-specific. This experience has led me to consider how environmental regulations are formed, and how they may be adapted to better protect people in unique environmental contexts.